Computational Molecular Biology / Bioinformatics, Comparative Genomics, Graph Theory, Combinatorics, Discrete Algorithms. 2014-present, Associate Professor, Computational Biology Institute & Department of Mathematics, George Washington University. 2009-2013, Assistant Professor, Department of Computer Science and Engineering, University of South Carolina. 2007-2008, Postdoctoral Fellow, Department of Computer Science and Engineering, University of California at San Diego. 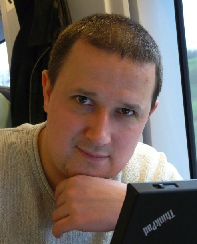 Dr. Alekseyev's research interests range from discrete mathematics (e.g., combinatorics and graph theory) to bioinformatics (e.g., comparative genomics). He views the research goal to be development and application of new methods of discrete mathematics to solve open biological problems that have recently emerged. A particular area of interest for Dr. Alekseyev are genome rearrangements representing the evolutionary events that change chromosomal architectures. While genome rearrangement analysis is a powerful tool for studying both chromosome evolution and chromosomal abnormalities in cancer, it has certain limitations. In a number of publications, Dr. Alekseyev extended existing algorithms to more complex cases (such as genomes with duplicated genes or rearrangement scenarios involving transpositions) as well as developed new biological applications (such as rearrangement hotspots analysis). In 2013, he received an NSF CAREER award for development of a next-generation phylogenetic reconstruction tool aimed at computationally hard but biologically important and controversial problems beyond the scope of existing methods. While Dr. Alekseyev has Ph.D. in computer science, his M.S. degree is in mathematics. Dr. Alekseyev finds such background very helpful in his research because it allows one to see unexpected connections of biological problems to various fields of mathematics. In particular, his research on multi-break rearrangements (representing a generalization of the ``standard'' genome rearrangements) not only simplified the analysis of some difficult biological problems but also resulted in rather theoretic developments relying on nontrivial algebraic techniques. For a list of publications, please visit Dr. Alekseyev's Google Scholar or personal webpage.